I love a trip to the bottle shop. Even better, when a trip to a bottle shop not only has you enjoying the wine, but also kicks a story your way. I bought a wine we hadn’t tried before — Taylors Pinot Noir Rosé. I don’t usually take much notice of the back label on a bottle, but this time something colourful caught my eye. On the label is a colour-code temperature scale, along with a large icon with the words ‘Current Temperature Indicator’. Too warm, too cold, or just right? This part of the label uses thermo-chromatic ink technology to provide information about the temperature of the wine in the bottle. Swipe your finger across the Current Temperature Indicator, and then match the colour of the label to the colour in the scale to the left, to see if you’re drinking the wine at its optimum temperature. This technology has been used by other winemakers for aesthetic reasons, but Taylors claim it as a first time use in wine education. Taylors was driven to using this technology based on results from customer research. It had found that 80% of Australians drink their red wine too warm, and their white wine too cold. Further, Taylors’ research found that 77% of respondents drink their white wine straight from the fridge’, while 21% go further, serving it directly from the freezer. What temperature is wine best served at? Given that the average fridge temperature is in the range of 3°C—4°C, and room temperature in summer can be 21°C—23°C, these conditions battle against the optimum serving temperatures of 6°C—12°C for white wine, and 12°C—18°C for red wine. “Red wine served too warm loses its balance of subtle flavours because the alcohol and tannins overpower the flavours and aromas, so by chilling for just 30 minutes, you get the complexity and balance of flavours that the winemaker intended,” says Neil Hadley, Taylors Wines’ resident Master of Wine. Taylors proposes a couple of 30 minute tests to taste the difference. Red wine: pour a glass, taste, put it in the fridge for 30 minutes, and taste again. White wine: pour a glass from a bottle that has been in the fridge, leaving the bottle out. Taste the wine in the glass again 15 minutes later. Then, from the bottle that has been resting out of the fridge for 30 minutes, pour another glass, and taste. “Drinking great wine shouldn’t be complicated, that’s why we’re encouraging people to take the Taylors Temperature Challenge, to make it as easy as possible for them to enjoy any bottle of wine at its very best,” says Managing Director, Mitchell Taylor. Want a set of labels to try? The optimum temperature sensor labels are part of Taylors’ Promised Land and Estate range of wines. 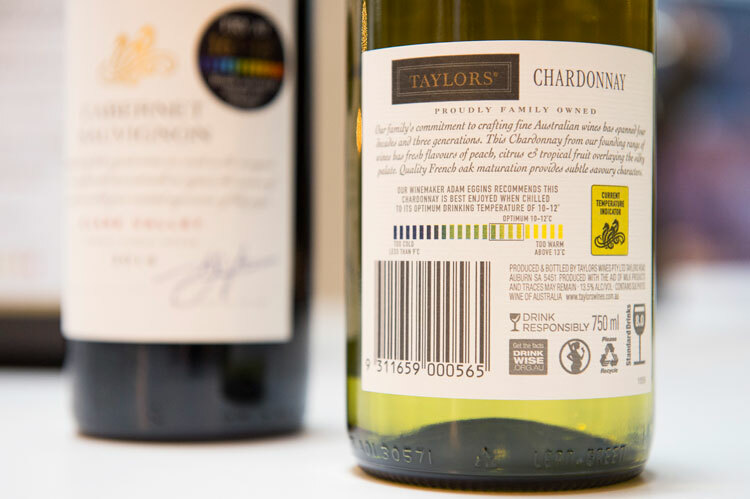 Or, if you’d like to try out the technology and your wine isn’t a Taylors, the company will send you a set of thermo-chromatic ink stickers to put on your other brand wines. Request your set of stickers at the Taylors Better by Degrees page.